In recent years, many politically active people have been attracted to Ron and Rand Paul. In addition, there has been a huge resurgence in the free-market writings of Ayn Rand. Out of that tradition came the film Thrive, which has been very popular among well meaning but naïve members of the New Age community. In response, the Praxis Peace Institute (www.praxispeace.org) published a pamphlet that exposed Thrive’s unstated, right-wing agenda. Now we’ve taken the next step. After searching for a systematic, book-length answer to the seductive attraction of libertarianism, the members of Praxis decided to write that book. 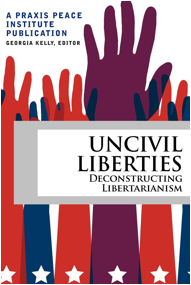 Six of us approached the subject from various angles, and the result is Uncivil Liberties: Deconstructing Libertarianism (http://www.amazon.com/Uncivil-Liberties-Deconstructing-Georgia-Kelly/dp/098861300X). This entry was posted in Uncategorized and tagged Barry's Blog # 51: Uncivil Liberties. Bookmark the permalink.